The clutch should be pressed all the way to the floor before shifting, then released slowly. Do not rest your foot on the clutch pedal while driving. This can cause unnecessary wear. Do not partially engage the clutch to hold the car on an incline. This causes unnecessary wear. Use the parking brake to hold the car on an incline. Do not operate the clutch pedal rapidly and repeatedly. 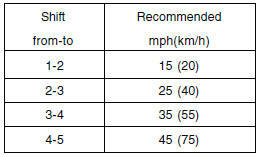 The shift points as shown above are recommended for optimum fuel economy and performance.